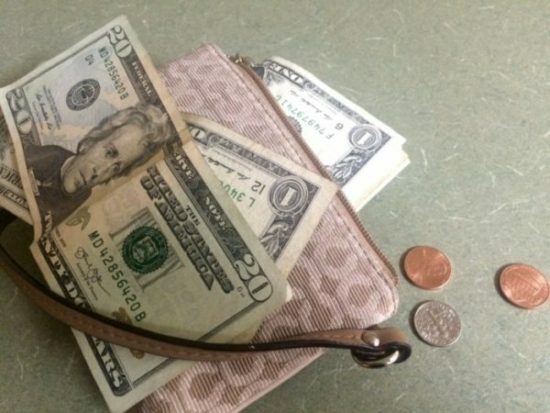 After second quarter GDP was revised up slightly for the second quarter, coming in at a solid 4.2 percent real growth, economic strength was seen in the July personal income report from the U.S. Bureau of Economic Analysis as well. ● First, an extended streak of solid growth in personal income continued in July with a gain of 0.3 percent versus June. ● Second, inflation, according to the personal consumption expenditures (PCE) price index, was calm at 0.1 percent in July. That’s the second month in a row of a mere 0.1 percent increase. Over the past four months, PCE inflation ran at less than a 2 percent annualized rate. ● Third, real per capita disposable income growth continued in July. While ignored by many, this measure is the most important bit of data offered in this monthly report. After all, real per capita disposable personal income is the income that individuals and families have for investing, saving and consuming. It is personal income less current taxes, while accounting for inflation and population. 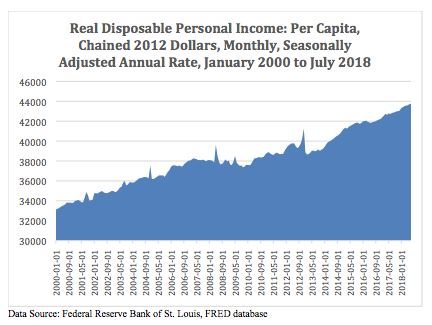 ● Fourth, real per capita disposable income growth has now extended to 13 straight months, rising from $42,726 (in 2012 dollars) in June 2017 to $43,769 in July 2018. In the following chart, we see the performance of disposable income since 2000. Six points are striking about this trend. ● First, growth in real per capita disposable income was solid from 2000 to just prior to the start of the Great Recession. ● Second, as expected, growth shifted to decline during and just beyond the recession. ● Third, the growth that subsequently resumed was reversed with a major tax increase imposed at the start of 2013. ● Fourth, it took about two years for real per capita disposable income to get back to where it was just before the 2013 tax hike. ● Fifth, stagnation set in, once more, from mid-2015 to mid-2016. ● Sixth, growth then kicked back in, and since July 2016, real per capita disposable income experienced growth in 23 of the last 25 months. In the end, rising disposable income is good news for investing, saving and consuming – a positive trio for the U.S. economy.